PANJI HOMESTAY APARTMENT is located at the prestigious likas bay area,is merely five (5) minutes away from financial and commercial district and city centre of kota kinabalu and 20 minutes drive from kota kinabalu international airport (KKIA). Guest will enjoy a various of recreational facilities such as early sunrise walking or sunset experience at the jogging track tanjung lipat,which is a stone throw away from apartment hotel. 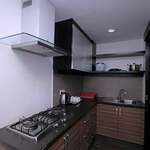 Added conveniences include private car park with ample parking space,shopping arcade with a supermaket,post office,hair salon,cafe and restaurant.Panji Homestay Apartment is often popularized by travelers with families,business or just leisure,searching for place to stay overnight or for long term stay. * RM 150 refundable security deposit is required upon check in.